Woodturning can be a very enjoyable hobby, and if one focuses on learning good fundamental woodturning basics, it can be a safe hobby too. The same woodturning techniques needed to turn spindles such as table legs, bed posts, stair rail spindles or finials can be applied to turning bowls, attractive pens, bottle stoppers and more. 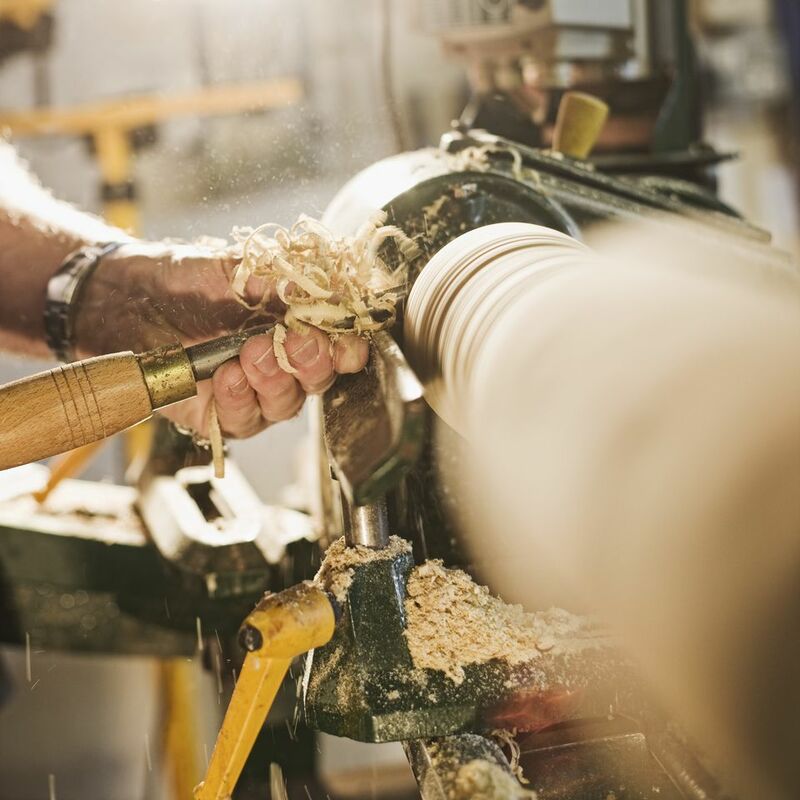 While this one article certainly cannot cover every aspect of safe woodturning, if the budding woodturner can learn and consistently implement all of the following points, their woodturning skill will develop quickly. One of the first and most critical skills a woodturner must develop is the ability to properly sharpen their tools. Properly sharpened gouges, skew chisels, parting tools, scrapers, and other lathe tools will cut cleaner and be less inclined to grabbing or gouging the wood stock being turned. Turning with sharp tools is much easier than when the tools are not at their best. Woodturning tools should be sharpened on a bench grinder, or better yet, a slow speed wet sharpener. Each tool has a particular bevel that must be maintained, and the curve of the sharpening wheel will help maintain the tool's concave edge. The wood that is being turned by the lathe must be turned at an appropriate speed. A variable speed lathe will typically turn the stock from about 500 RPM to a max speed of about 4000 RPM. A good rule of thumb is, "the wider the stock, the lower the speed." In other words, a relatively narrow piece of stock (about 2-1/2" in thickness or thinner) can be turned at about 1500-2000 RPM (longer pieces should be cut at the lower end of the range), while thicker pieces should be turned at about half that speed. Left-handed woodturners will likely want to reverse the hands. When turning, the gouge, chisel or scraper being used should always remain in contact with the tool rest. There is no such thing as safe "free-handing" on a lathe. Ideally, the tool rest should be about a quarter-inch away from the wood, and the cutting tool needs to be in contact with the tool rest before it comes into contact with the wood. Additionally, there should be a limited distance between the point where the tool comes into contact with the tool rest and where it contacts the wood. The greater the distance between the two points of contact, the less support that is provided to the tool. One key to safe woodturning is to remember to always keep the bevel behind the sharpened edge of the tool resting on the wood. Following this rule will help keep the tool from taking too much off at one time, or worse, grabbing the wood and perhaps ripping the tool out of the woodturner's hands. When beginning to cut with a tool such as a gouge, while keeping the tool on the tool rest, lay the back edge of the tool onto the spinning wood so that the point of contact is on or behind the bevel, but that the tool's cutting edge is not yet cutting. Once contact is safely made, use your right hand to slide the tool backward (toward the body, away from the lathe) until the cutting edge begins to engage the wood. Throughout the entire cutting process, the bevel should remain in contact with the wood. When woodturning, one should always work "with the grain." Turners often refer to this as cutting downhill. For instance, when hollowing out a cove, cut from the edges toward the center. Cutting from the center out toward the edge of the cove would be considered as cutting uphill, which is far harder to control and could easily cause the tool to grab (since it is very difficult to cut uphill and still keep the bevel of the tool on the wood). When working with gouges, chisels, parting tools, and other cutters, the rear hand (the one on the handle) should always be lower than the forehand (on the tool rest). This will keep the tool a leading position, where the wood will be turning into the cutting edge of the tool. However, a scraper should be used in exactly the opposite manner. A scraper doesn't cut like a chisel but works more like a butter knife. As such, the rear hand should be higher than the forehand, which will allow the cutting edge of the scraper to be beneath the tool rest, and be in a trailing position to scrape the wood. As with any skill, it takes a lot of practice to become a good woodturner. An experienced woodturner makes it look easy, a point that will be driven home the first time the novice begins to turn. One thing almost every novice turner will notice is that they're so focused on following the above tips that they have a "death grip" on the tools. The grip on the tool should be firm and in control, but one should avoid "choking" the tool. After a bit of time on the lathe, the novice turner will begin to relax their grip on the tools, and at that point, they'll find woodturning becomes a little easier. Also, remember that it takes time to become a good woodturner. This is a skill that can only be learned with practice and patience. However, that practice time spent on the lathe will be quickly rewarded with improved results.